TRADER 9: Trade of the day, MMR!!! I saw this stock MMR taking a nosedive yesterday and I tried to catch the bounce, but ended up getting stop-out immediately. No fear, I was relentless in getting back in again today if it had lower lowers, and "lo and behold" it gaped down hard right at the open. I switch to my 1-minute intraday chart from my 5 minute chart after it broke its' 52-week low of 7.76 for some consolidation to find an entry price. I went long 1000 shares at 7.45 after some nice consolidation around 7.30-7.40 on the 1-minute bar chart. 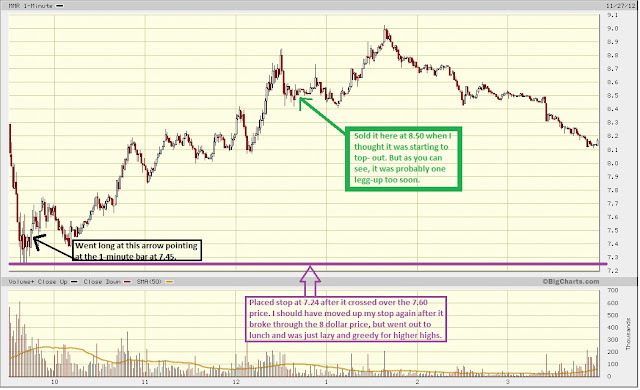 After it broke through 7.60, I placed a stop at 7.24 just in-case it tried to retrace down to new lows. I had a lunch date today around 11:00a.m est about 10 miles from my place so I couldn't stay and watch it. After I came back from lunch about 12:30 I was very excited to see I was up over 1 point. I decided just to take my gains and be done with this stock for now because I thought it was getting a little toppy, so sold at 8.50 for a 1.05 point gain. If you look at this chart from yesterday on a 2-day range 5-minute bar chart you'll see this is a perfect example of how I trade my signature Dead Cat Bounce strategy. Nice $1000 profit. I saw this bounce today also. You really know how to play them.